The new DeKalb High School on Dresser Road is ready to greet students. When the new DeKalb High School first opens its doors to students Tuesday, Sept. 6, every member of the Barb family will see what District 428 Board of Education President Tom Matya already sees. “What a wonderful asset this (District 428-NIU) partnership is for the DeKalb community,” Matya said recently as he joined his school board colleagues, district administrators and NIU leaders at the new building for a presentation of the District 428-NIU partnership’s activities. NIU’s contingent included Executive Vice President and Provost Ray Alden; deans Chris McCord, Mary Pritchard and Promod Vohra; and other university personnel who have worked on District 428-NIU partnership activities for several years. “The range of partnership activities is extraordinary, but the best thing about this collaboration is that in almost every case we are solving shared problems,” Alden said. Creation of a new concept for an elementary school to address enrollment issues in DeKalb Community Unit School District 428 began six years ago. 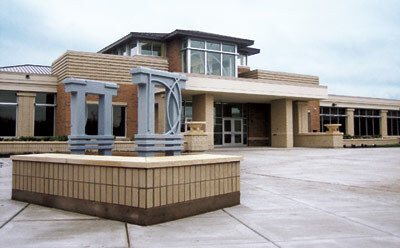 At its inception, Paul T. Wright Elementary was designed to be the first professional development school in the district. Working collaboratively, representatives from the district, the university and the community developed a plan for opening the school with a focus on integrating technology into all aspects of instruction, including special subjects such as PE, art and music. Principal Gina Greenwald visits with students at the former Wright Elementary School. Three years later, a second PDS elementary at Chesebro was developed. With this fall’s opening of Founders Elementary, combining Wright and Chesebro, Greenwald said NIU faculty and staff have been helpful in organizing the transition into a new school building. NIU research and reports from local principals both indicate that those candidates who participate in professional development schools are better prepared to begin their career in education. These same candidates also tend to make education a life-long career choice. With this evidence in mind, the partners began planning a professional development school at DeKalb High School. Three years later, the new DHS is about to open with a classroom for NIU students who will spend part of the day in class and part of the day working in classrooms with DHS students and teachers. DHS students will benefit from additional attention and support, as do students at Founders Elementary. NIU students co-teach at DeKalb High School. It’s already evident in the popular STAR tutoring program, Superintendent Jim Briscoe said. Meanwhile, he said, the program proved advantageous to both sides. Data collected from more than a year’s worth of operation of STAR tutoring indicates that both the DHS students and the NIU candidates find the program to be academically rewarding. Mutual benefits are nothing new, of course. District 428 and NIU long have shared facilities and equipment far beyond the telephone switches and new operational technologies. Athletic facilities such as tennis courts, high jump pits and football fields have been used by both NIU and 428 teams for decades. During the past 10 years, NIU students learning to teach with technology got hands-on experiences in classrooms equipped with laptops, mobile devices, digital cameras and other equipment donated to schools by NIU. Technology liaisons from NIU worked directly with 428 teachers in those schools, raising teachers’ skills at using technology to improve student learning. Herb Kuryliw of NIU’s Information Technology Services helped to build the high-speed broadband networking to District 428 buildings. “NIU needed partners to build the network to all NIU facilities, and District 428 buildings were on the way. In 428, we learned a great deal about working with school districts, and that has been very helpful as we build 2,200 miles of fiber optic networks across northern Illinois,” Kuryliw said. Professional development for teachers and NIU faculty also is a staple of partnership activities. In addition to credit courses and cohorts for masters’ and doctoral degrees, faculty from the district and the university develop workshops to meet student learning needs with well-tested techniques. 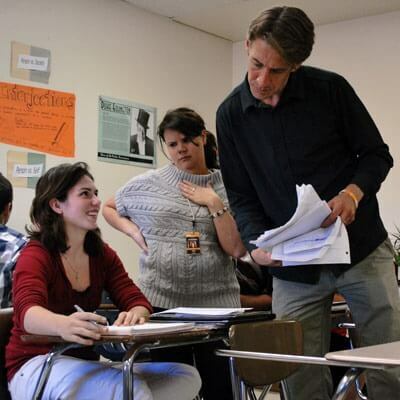 Fred Heuschel, who teaches humanities and media literacy at DHS, and his co-teacher speak with a student about her classwork. Similarly, District 428 experts teach seminars for NIU teacher candidates in topics such as Response to Invention, a state and federal mandate for customizing instruction to individual needs. At DeKalb High School, an NIU facilitator works with teachers in humanities, math and science to compare the curriculum they are actually teaching to state expectations and ACT’s college readiness benchmarks. DeKalb teachers define real-world challenges and work with NIU’s teacher preparation and research faculty to test new ideas in a collegial environment. Faculty from the district and the university conduct joint research, publish their findings and make presentations together at national professional conferences. Despite the tremendous success, Briscoe and Alden concur that building and maintaining partnerships is not for the faint-hearted. They recognized the number of hours contributed by both faculty and staff of NIU and District 428 in meetings and joint activities. And, they both agree it is time well-spent as the outcomes from working together have generated positive results. “A steady, well-established relationship helps this partnership to overcome obstacles,” Alden said. Briscoe, whose arrival in DeKalb came after many of the activities were under way and creating positive results, applauds the partnership’s laying of groundwork for additional opportunities in the future. NIU takes great pride in the collaboration, President John G. Peters said.